Ride Through the Rainforest & Admire the Scenery Along the Way. 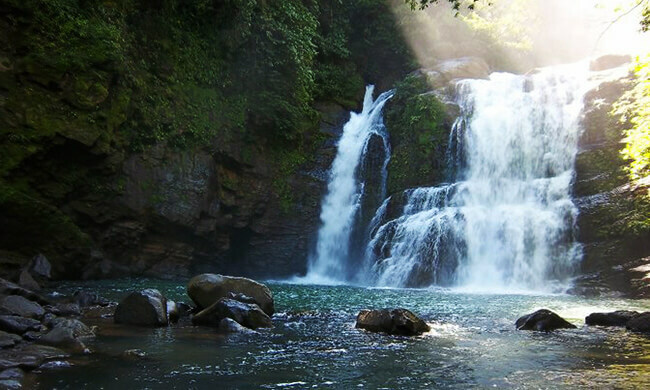 Ride a horse on a jungle trail that leads you to a beautiful 600-foot waterfall! Hear the roaring sounds of the plummeting water through the dense greenery, before its stunning beauty appears before your eyes. Your adventure starts in the early afternoon, when you’ll get a ride to this off-the-beaten-track location in the Jacó mountains. When you arrive at the park, meet your guide who will give you a safety lesson. Then, saddle up! It’s time to ride. Climb up the trail and observe lush jungle vegetation as your guide offers his naturalist expertise. This is a land of squawking scarlet macaws and toucans, monkeys, sloths, and colorful hopping frogs. Observe immense trees and diverse plant species. There are opportunities along the trail to spot the Pacific Ocean, coastal fishing villages, and vast plantations: be sure to have your camera ready! Your trail will end in a visit to Bijagual Waterfall where you can admire it from the bottom up, truly appreciating its immensity. Dismount from your horse and explore the surroundings on foot. This tour is great for nature-loving adults and families alike, who will enjoy the challenge of horseback riding on a trail through lush tropical forest. Horseback riding can be physically demanding for anyone who has never ridden a horse before. Guests are recommended to feel comfortable on a horse for an extended period of time. Please note: This tour has a weight restriction of 230 lbs. It’s not recommended for pregnant women and people with spinal or back problems. Minimum four people are required per tour. Your tour includes: Transportation from/to your accommodation, horseback riding gear, experienced bilingual guide, snack, drinks. What to bring: Camera, sunscreen, insect repellent. Guests should wear long, light pants comfortable enough to ride in; a cool t-shirt, hat, sneakers, or good walking shoes.